The definitive report on the disruption of the news media over the last decade. 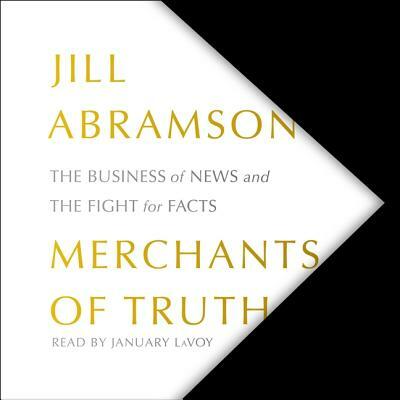 With the expert guidance of former Executive Editor of The New York Times Jill Abramson, we follow two legacy (The New York Times and The Washington Post) and two upstart (BuzzFeed and VICE) companies as they plow through a revolution in technology, economics, standards, commitment, and endurance that pits old vs. new media.Merchants of Truth is the groundbreaking and gripping story of the precarious state of the news business told by one of our most eminent journalists. Jill Abramson follows four companies: The New York Times, The Washington Post, BuzzFeed, and VICE Media over a decade of disruption and radical adjustment. The new digital reality nearly kills two venerable newspapers with an aging readership while creating two media behemoths with a ballooning and fickle audience of millennials. We get to know the defenders of the legacy presses as well as the outsized characters who are creating the new speed-driven media competitors. The players include Jeff Bezos and Marty Baron (The Washington Post), Arthur Sulzberger and Dean Baquet (The New York Times), Jonah Peretti (BuzzFeed), and Shane Smith (VICE) as well as their reporters and anxious readers. Merchants of Truth raises crucial questions that concern the well-being of our society. We are facing a crisis in trust that threatens the free press. Abramson's book points us to the future.